You are not limited to editing the sample pages that were created with your website. You can add as many pages as you need. From the New menu, select Page. Alternately, you can click on Pages > Add New from the toolbox on the left. Type a title in the Enter title here field. Type or copy and paste your content in the Body. Click Preview to see how your content will look before you Publish. 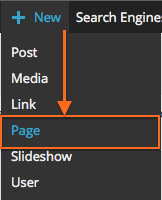 When you are happy with your new page, click the Publish button. Your new page will be live on your web site. Click the View Page link or button to see your page live on your web site. Note: Your new page will not be added to your menu automatically. However, you can easily add a menu item by following the Edit the Main Menu instructions.